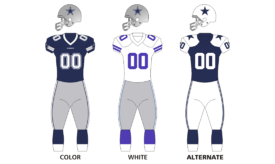 The 2015 Dallas Cowboys season was the franchise's 56th season in the National Football League, the seventh playing their home games at AT&T Stadium and the fifth full season under head coach Jason Garrett. The team finished the regular season at 4-12. It was the team's worst record since 1989, in Jerry Jones' first year as owner when they went 1-15. Despite starting the season 2-0 and leading the NFC East, the Cowboys lost their next seven games and finished the season by going 2-12 in their final 14 games. Their collapse from a solid start was primarily due to injuries by starting quarterback Tony Romo and starting wide receiver Dez Bryant, which both occurred in week 2 of the season. Brandon Weeden started the next 3 games in which he lost, and then was benched in week 7 following the bye week in replacement for Matt Cassel who was, at the time, just released by the Buffalo Bills. Cassel then lost the Cowboys their next 4 games until Tony Romo recovered from his broken collarbone injury and won their first game in 9 weeks against the Dolphins. However, in a week 12 loss against the undefeated Panthers, Romo suffered a second collarbone injury and was later ruled out for the season. Matt Cassel then started the next 3 games for the Cowboys with a week 13 win against the rival Redskins. However, after a poor performance against the New York Jets in week 15 in the 1st half, Cassel was benched in favor of backup Kellen Moore, who then went on to lose the rest of the games of the season. The Cowboys opened the season at home against their rival, the New York Giants, led by the quarterback-receiver tandem of Eli Manning and young Odell Beckham. Shining atop the division, the Dallas Cowboys played the Philadelphia Eagles in what turned out to be a defensive juggernaut of a game. Neither team could really get anything going on offense; however, the Cowboys were able to pull away by dominating the time of possession. Already missing starting wide receiver Dez Bryant, the Cowboys experienced a devastating loss when Tony Romo was sacked. The result of the hit was a fractured collarbone and an expected eight-week absence. The fractured collarbone is the same one Romo broke in 2010. Brandon Weeden got his first taste of game time this season, completing all 7 passes for a total of 73 yards and one touchdown. Despite the injuries to the two key players, the Cowboys still managed to hold off the Eagles with a 20-10 victory, ultimately stunning Philadelphia's home crowd. Dallas' defense harassed Sam Bradford and ex-Cowboy DeMarco Murray all game, holding Murray to a measly 2 yards. Sean Lee, a defensive powerhouse, finished the game with 13 tackles and an interception for the Cowboys. For his performance, Lee was given the honor of being named NFC Defensive Player of the Week. So many questions surrounded the Dallas Cowboys as they entered Week 3. With no Dez Bryant or Tony Romo, how would the rest of the team respond? Coach Jason Garrett’s mantra of “next man up” played a big part in preparing for the game against the Atlanta Falcons. Backup quarterback Brandon Weeden started for the first time since last season against the Arizona Cardinals, but this outing was much different. He completed 22 of 26 passes for 232 yards. Although he threw one interception and had zero touchdowns, the loss could not be blamed on him alone. The Cowboys played very well in the first half, outscoring the Falcons 28-17; however, the Falcons made a few halftime adjustments that squashed any running game the Cowboys pursued. On the other hand, the Cowboys had no answer for Julio Jones, who ran 164 yards and had 2 touchdowns. Owner Jerry Jones said after the game that the Cowboys just looked tired in the second half. In typical fashion for this season, the Falcons came back late in the third quarter and won the game 39-28. In another heartbreaking loss which ended the 9-0 streak of regular season away games, the injury bug struck again. Sean Lee exited the game early with a concussion, Lance Dunbar saw the last of his playing time this season with a torn ACL, and Brice Butler injured his hamstring. Despite all the injuries, the Dallas Cowboys were able to stay neck and neck with the New Orleans Saints. After back-to-back losses, Dallas returned home to face the undefeated NFL Champion New England Patriots. Stout early defensive efforts kept the game close including five sacks of Patriots quarterback Tom Brady, but Dallas’ offense could never steadily produce results. Dallas QB Brandon Weeden (1 INT) and the offensive line were ineffectual, gaining only 264 yards total offense and making 18 1st downs. The offense could manage only two Dan Bailey field goals. During the first quarter, the Cowboys held the Patriots to a field goal. Slowly but surely, the Patriots pulled away for the 30-6 victory, handing Dallas the loss and a 2-3 record entering the bye week - and handing Cowboys coach Jason Garrett his first career three-game losing streak. Despite sloppy, penalty-ridden play helping enable three lead changes Dallas was able to tie the game at 20 when Cassel threw a beauty on a 25 yard touchdown pass to Devin Street who had an even better catch, tapping his feet inches from the end line. However, the Giants returned the ensuing kickoff for a touchdown, immediately regaining the lead. Later, a quick "three and out" by the Giants' offense preceded a Giants punt which was fumbled by Cole Beasley and recovered by the Giants, who then ran out the clock on subsequent "kneel downs" to finish the game. The loss hands Dallas a four game losing skid heading back home to face the defending NFC champion Seattle Seahawks. The Cowboys travel to Lambeau to take on the Packers in a rematch of last year's Divisional Round, in which Green Bay narrowly won after Dez Bryant's controversial catch was overturned, allowing the Packers to advance to the NFC Championship. This time, Green Bay won handily, 28-7, which dropped the Cowboys' record to 4-9. ↑ "2015 NFL Draft Pick Transactions". ProSportsTransactions.com. ↑ "Dallas Cowboys 2015 Team Transactions - Trades, Injured List, Free Agents, and Signings - ESPN". ESPN.com. Retrieved 20 December 2015. ↑ SI Wire (17 September 2015). "Giants vs Cowboys: NFL admits two blown calls - NFL - SI.com". SI.com. Retrieved 20 December 2015.